JŽ class 189 0-6-2T 189.005 (Krauss Linz/1887) at Sarajevo engine shed. 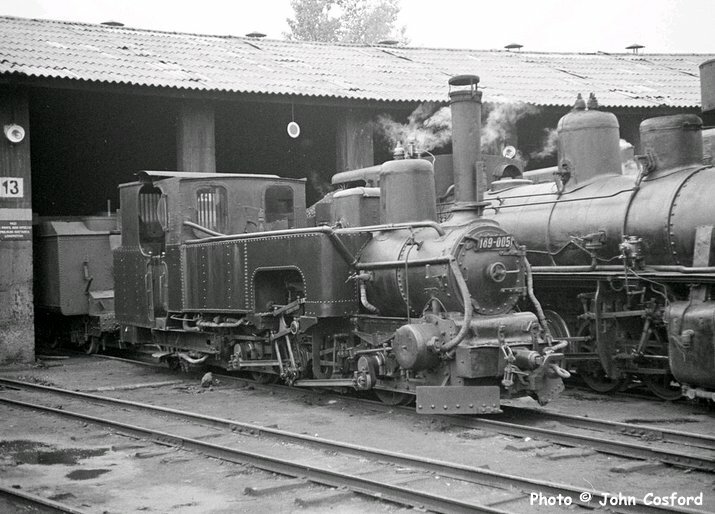 This strange looking machine was one of 19 delivered to the BHStB (Bosnisch Herzogowinische Staatsbahn, successor to the Bosnabahn) between 1885 and 1893. They had inside cylinders and outside frames and used the Klose system of articulation which allowed the outer coupled wheels to swivel by effectively lengthening or shortening the coupling rods. To further complicate matters, the rear half of the cab and bunker were mounted on the pony truck and swivelled with it! A close-up of the Klose system on JŽ class 189 0-6-2T 189.005 at Sarajevo engine shed. 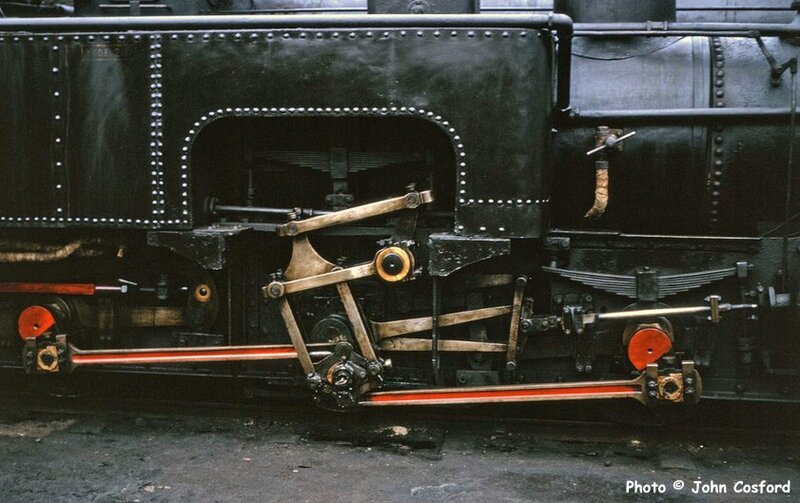 The Klose system of articulation allowed the outer coupled wheels to swivel by effectively lengthening or shortening the coupling rods. 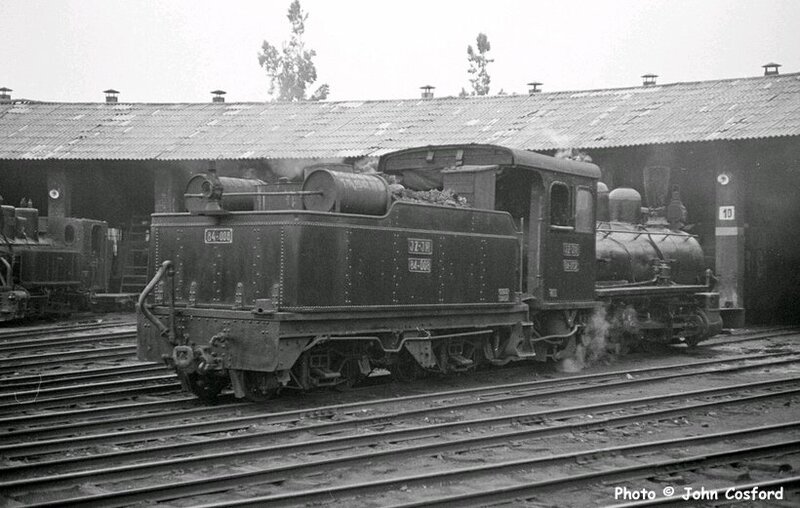 JŽ class 84 2-8-0 84.002 (Alco/1915), coupled to the tender from 84.008, at Sarajevo engine shed. 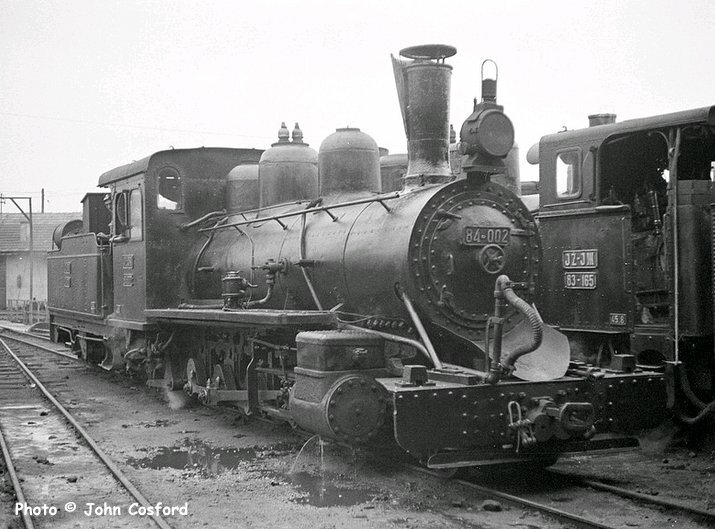 This was one of a class of 12 typical American locomotives all supplied to the Serbian State Railways (SDŽ) by Alco in 1915. There were only five left in 1965 of which 84.002 and one other were at Sarajevo shed at the time of out visit. 84.002 was the pride and joy of the shed master who had it taken out of the shed and was very proud to show it to us. 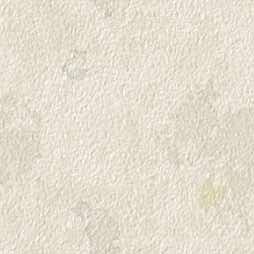 Maybe he thought that we were Americans! A rear three-quarter view of JŽ class 84 2-8-0 84.002 (Alco/1915) at Sarajevo shed. 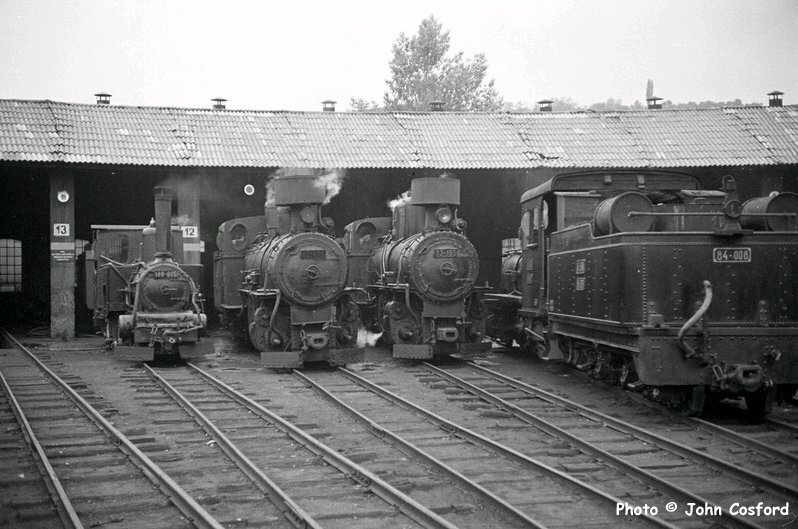 A line up of JŽ 760mm locos from Austrian, Hungarian and American builders at Sarajevo engine shed. 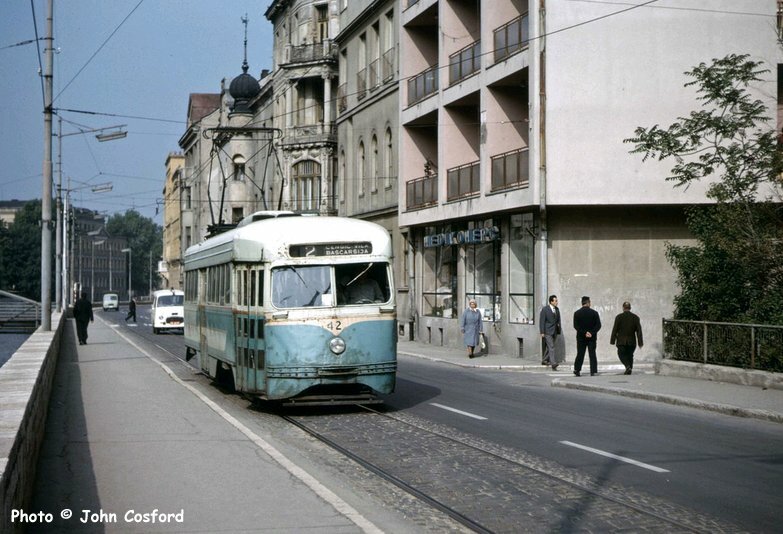 Ex-Washington DC PCC tram no 42 (St Louis Car Company/1937-44) on Route 2 running along Appel Quay in Sarajevo. This was one of a batch of 70 that were delivered to Sarajevo between 1958 and 1961. 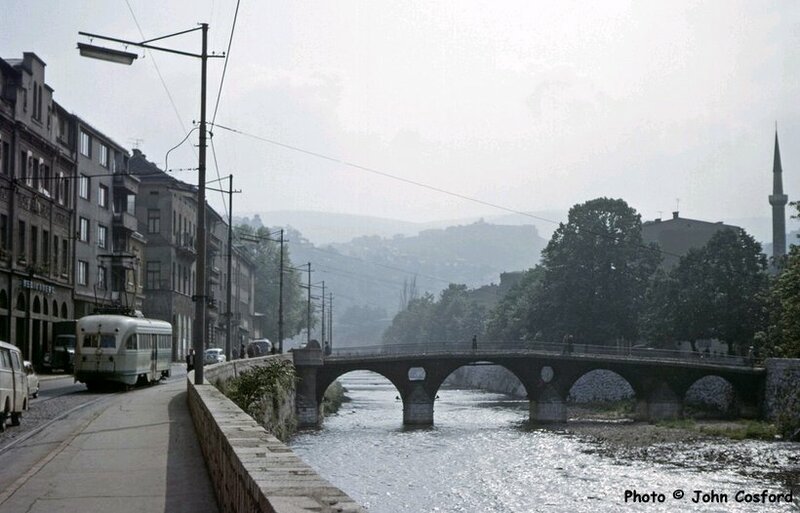 Another shot of ex-Washington DC PCC tram no 42 on Appel Quay alongside the Bosna River in Sarajevo. It is passing the spot (approximately) where the Archduke Ferdinand was assassinated by Gavrilo Princip on 28th June 1914.